If you’ve never heard of witch hazel, you’re in for a treat. Why? Because this natural astringent is not only awesome for your skin, but it has plenty of other amazing uses as well. First of all, let’s take a closer look at witch hazel itself. Witch hazel, also known as winterbloom or spotted alder, is actually a flowering shrub common in North America. The leaves, bark, and twigs of witch hazel are high in tannins. Tannins are found in any natural astringent because of their ability to tighten, dry and harden tissues. The witch hazel water you can buy for $2 at any any drugstore is actually a steam distillation of the bark, leaves, and twigs of the shrub itself. Witch hazel (the astringent) has a wonderfully clean smell that’s hard to describe. But if I had to pick one of my top three favorite smells, witch hazel would make that exclusive list. It’s just an instant pick-me-up. Native Americans have been using witch hazel water as a medical astringent for centuries. And with good reason. In the book The New Age Herbalist, by Richard Mabey, witch hazel has five different entries. Which means it’s a powerhouse natural herb and an important product if you’re striving for a healthy lifestyle. The wonderful thing about witch hazel is that it’s 100% natural, and cheap too. Because it has so many uses, it’s a great addition to any medicine cabinet. So what can you use witch hazel for? You don’t need to waste money on harsh chemical toners that claim to “zap your acne to bits.” Witch hazel is an effective, gentle, and natural way to treat acne or oily skin. I’ve used witch hazel on my skin (mostly during the summer months) for years with great success. 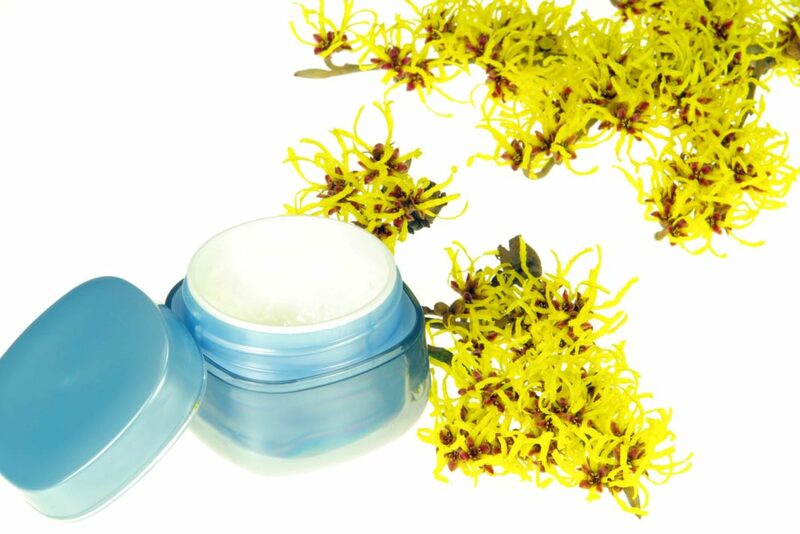 So be sure to add witch hazel to your list of the best natural acne treatments. If your eyes are puffy from crying or lack of sleep (or both), then soak two small cotton pads with witch hazel and put them over your eyes. Witch hazel is famous for shrinking blood vessels (which is why it’s one of the main ingredients in Preparation H cream). If you’re lucky enough to have a witch hazel bush growing nearby, you can easily make witch hazel tea by soaking some leaves and twigs in a cup of very hot water. Add a few cloves for flavor and soak for at least 15 minutes. Then, strain off the solids and gargle with the tea. Because of witch hazel’s ability to soothe and reduce swelling, this is an excellent, ancient remedy for sore throats. Consider adding it to your arsenal of the best natural cold and flu remedies at home. Soak a thin cloth in witch hazel and lay it on your varicose veins. Applied daily, this is a natural (and cheap) way to reduce the appearance of varicose veins. Witch hazel is amazing when it comes to healing bruises. Again, soak a thin cloth in witch hazel and apply it to your bruise several times a day until the bruise is gone. Your shiner will be gone a lot quicker if you use witch hazel to speed the healing process. There’s a good reason why many tattoo artists cleanse a brand new tattoo with witch hazel. The reason is because it cleanses the skin of germs and bacteria, and also soothes inflammation. You can use witch hazel to cleanse any wound or scrape, big or small. If you’re trying not to scratch anything, from chicken pox to poison ivy to a sunburn, soak a cloth or cotton ball with witch hazel and rub it on your skin. Witch hazel works awesome for soothing itchy skin. My favorite use for witch hazel is as a simple skin refresher in the summer. After I’ve been out in the heat, my skin gets oily. I’ll soak a cotton pad with witch hazel and use it to cleanse the oil, dirt and impurities from my skin. It’s not only refreshing, by my skin glows after I’m done. And, I smell great too! Remember when I said that astringents “tighten”? Well, this goes for your pores too. Witch hazel is a wonderful way to tighten up large pores. Although witch hazel does remove oils from your skin, it won’t dry it out like other commercial astringents. When you use witch hazel right after a shower it will actually help seal in moisture, which is wonderful if you have dry skin in the winter months. Witch hazel is one of those simple, natural products I always keep on hand. It has a ton of really practical uses, and since it’s so cheap (around $2-$3 in drugstores) it just doesn’t make sense not to have it – especially when it will easily replace so many other expensive commercial products. I’d love to hear back from you on this. Do you use witch hazel in your home? What for?